Missed the show? Fear not! Listen here: “The Layover Show – Females Takeover Edition” on Traklife Radio! We come on around 1:25:40. Special thank you to Traklife Radio for having us! We had so much fun and can’t wait to link up again soon! Watch us on the video around 01:07!! Hello Lattes! Bella and I are pleased to announce that we will be featured guests on The Layover Show on Traklife Radio – along with DJ Ivy and DJ Rated Ar. 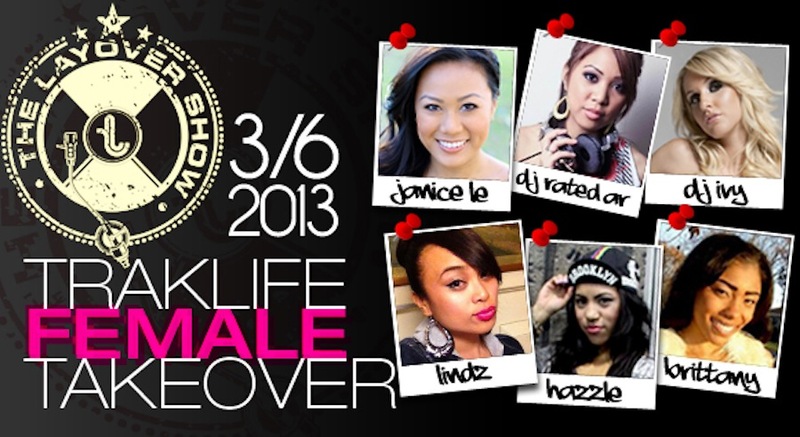 Tune in to Traklife with hosts Janice Le and Lindz on March 6 at 8-11 p.m. PST. You can listen live on Traklife.com or download the free Traklife App on your phone. We’ll be talking about LLL and our journey to success. The Traklife Female Takeover is a show you don’t want to miss!!!!!!! We’ll be tweeting and instagramming so make sure to follow us, as well as the Lipstick Lace And Lattes’ account.